A modern version of the Mattel® UNO® Attack! 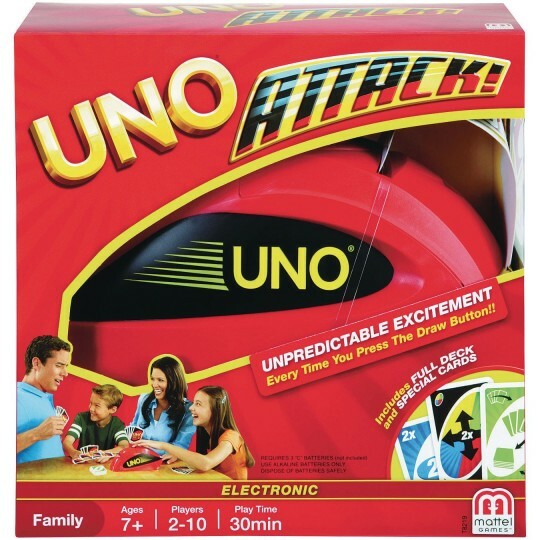 This game is a modern version of the Mattel® UNO® Attack! Game. Ideal for kids above the age of 7 and adults, this rapid fire variation of the original will throw the players into an unpredictable and thrilling frenzy. The UNO Attack! card game comes with a special electronic card shooter and an exclusive Attack! command card. Push the launcher button, and if you're lucky, nothing will happen. If you're not, the shooter will fire a stream of cards just for you. The sleek random card launcher ensures fast fun for everyone. The UNO game shooter also makes different sounds to further enhance your experience. This set includes 112 cards for nonstop fun. You can store the cards right in the shooter, making the unit portable and storable.